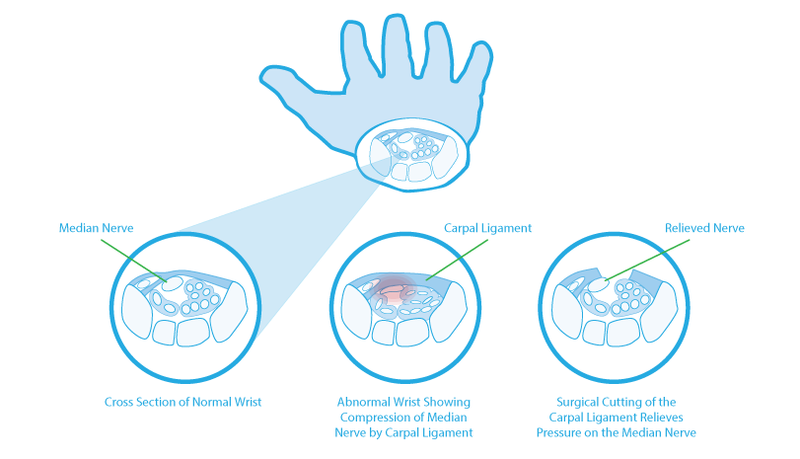 Carpal Tunnel Syndrome (CTS) is caused by pressure on the median nerve in the wrist. Symptoms include pain and weakness or tingling in the hand that can wake patients in the night. Symptoms are often present during the day as well. CTS can be caused by normal aging or a large amount of repetitive movement of the wrist. Other causes include fracture or dislocation of the wrist as well as fluid retention. Conservative measures consist of behavior modification (avoid aggravating motion), wrist splints, anti-inflammatory medication, and occasionally, wrist injections. Typically, a minimum 2-4 month trial of conservative treatment is undergone before consideration is given to surgery. In cases where medical therapies do not provide adequate relief or where there is the possibility of permanent nerve damage, surgery is appropriate. The procedure is performed on an outpatient basis. A 1-2 inch incision is made over the carpal transverse ligament at the base of the hand. The ligament is then cut relieving the pressure which it had inflicted on the median nerve. The procedure successfully relieves symptoms in 90 - 95% of cases. Your method of telling everything in this piece of writing is actually fastidious, every one be capable of easily know it, Thanks a lot. a blog. I bookmarked it to my bookmark webpage list and will be checking back in the near future. Asking questions are truly nice thing if you are not understanding anything totally, however this article offers good understanding yet. I'm pretty pleased to find this page. I want to to thank you for your time for this particularly wonderful read! !